Nothing says “holiday” to me like the smell of gingerbread baking in the oven. I am crazy about that combination of molasses and fragrant spices that are quintessential to gingerbread. I have made lots of different baked goods with this characteristic flavor — gingerbread pancakes, waffles, cookies, biscotti, and of course, the classic gingerbread cake, my most favorite of all. I even make a pan of gingerbread for Thanksgiving as my official signal that the holidays have begun. But my feeling is if you’re going to make gingerbread, you really need to go for it. I use a heavy hand with the spices, especially, you guessed it, GINGER. This recipe, I have to admit, is DELICIOUS. 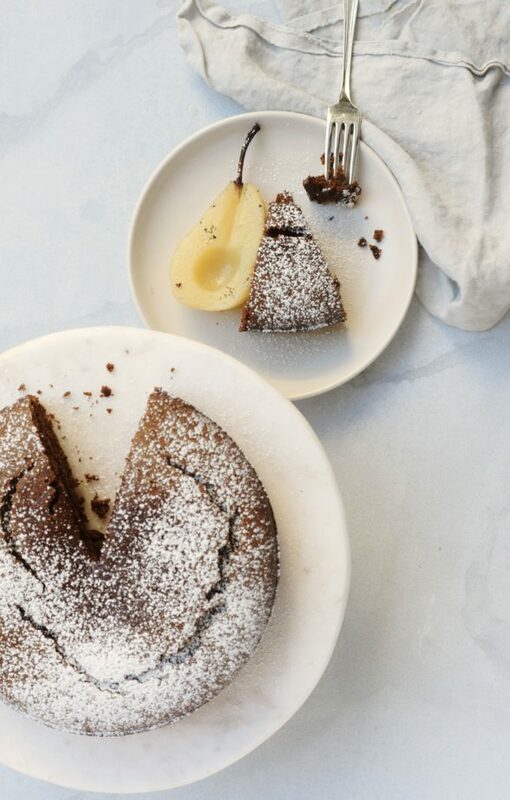 It’s exactly what I want it to be — high-quality ingredients like whole wheat pastry flour, coconut oil, maple syrup and molasses that come together to make a moist, dense, intensely flavorful cake. Daughter #1 said to me recently, “who knew gingerbread could be this good?” Love her. Actually, my whole family loooves this cake, even Mr. Picky whom I have caught more than once in the last month in the pantry with the door closed sneaking extra gingerbread. The cake always gets eaten rather quickly at our house. In fact, I should really adapt the recipe to fit a much larger pan. The only time my kids didn’t like this was when I used blackstrap molasses. I wanted to see if they could taste the difference which they did and said, “no, thank you!” Molasses is the by-product of refining sugar and is sold in grades according to how much it as been boiled. “Blackstrap” molasses is the result of the last boiling and thus has the most intense flavor and the highest mineral content. 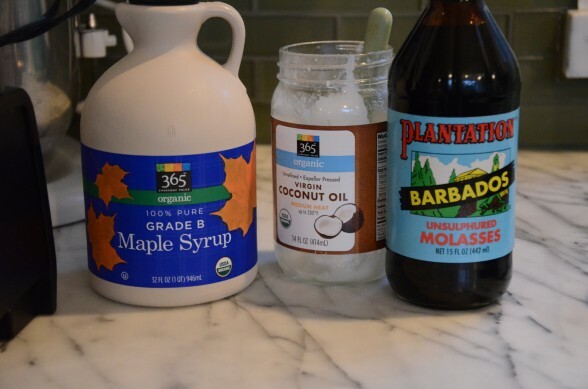 I figured this was a good thing, but molasses is rather bitter and blackstrap molasses is way too bitter for my kids. So I gave up a little extra iron and potassium for “regular” unsulphured molasses that would taste good to them. During the holidays, I’m in the business of making people happy, which in turn makes me happy. And this gingerbread does both. Enjoy! Preheat the oven to 350 degrees. Line a muffin tin with paper liners or grease and flour an 8-inch square baking dish. 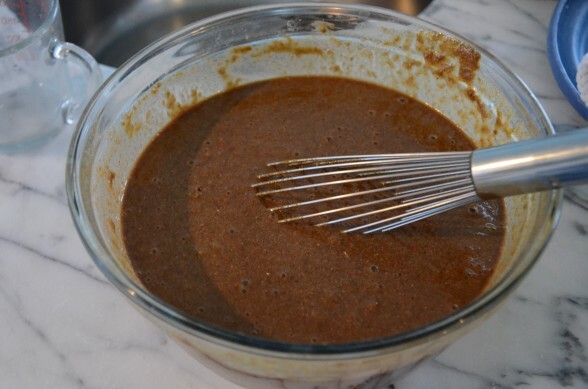 In a blender, combine the molasses, maple syrup, applesauce and coconut oil. Blend until smooth. In a large bowl, sift together the flour, baking soda, sea salt and spices. 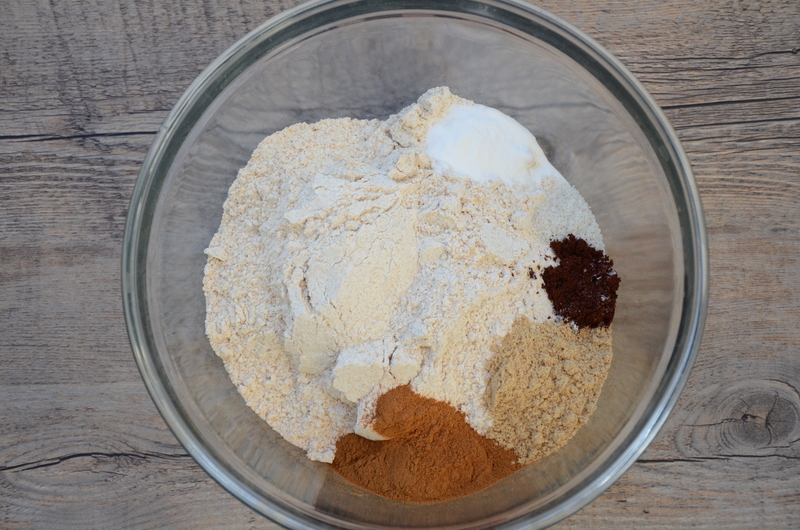 Pour the wet ingredients into the dry and mix until just combined. Stir in the hot water. Pour into the prepared pan. Bake 20-25 minutes for muffins or 35-50 minutes (ovens vary wildly) for an 8-inch cake, until a cake tester inserted in the center comes out clean. Allow to cool before serving. Sift powdered sugar over cake, if desired. The batter seems to be about the right consistency withou the hot water. Should I still add it? Yes. I have never made this without the hot water and I don’t see how it would turn out the same way without adding it. This cake is DELICIOUS, gooey, moist and satisfying. Thank you so much for sharing. Do you happen to know the nutrition facts? How many calories is the whole baked batter? Thank you so much for this fantastic, easy to follow and absolutely delicious recipe! I made a half batch to share at work, and everyone loved it! I have another half batch in the oven now, using part oat flour, part acorn flour and some xantham gum- I can see a future filled with lovely gingerbread cakes for so many occasions! Oh, how wonderful! Yes, after you try the recipe the first time, you can see all sorts of possibilities :). I subbed white unbleached flour and Earth Balance non soy variety (what I had on hand), a pinch more ginger based on other comment here, and this turned out fantastic! I brought it to the office potluck and it was well received. Thank you for the recipe and very clear instructions! I sifted confectionery sugar on top at the event. I just came across this recipe and it is AMAZING! Thank you!! AMAZING!!! 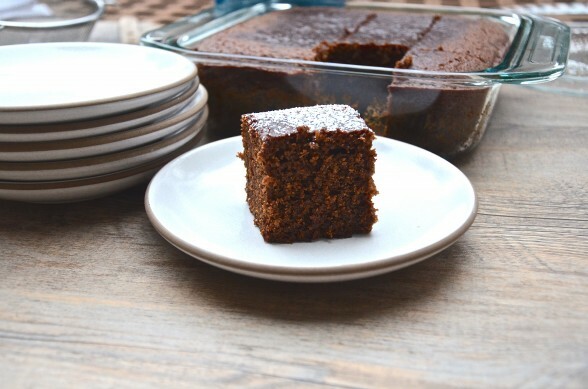 I used this recipe as a base for an Upside Down Pear Gingerbread and it came of FABULOUS!!! I used a 9 inch round pan. I opted for the Earth Balance vegan butter sticks and the white whole wheat flour. The only change I made was 4 teaspoons of ginger instead of 3. I will make this again for sure. THANK YOU!!! I love all your adaptations, especially doing an upside down pear version! Nice! Do you think it would work to do half whole wheat pastry flour and half brown rice flour, instead of all whole wheat? Can’t wait to try this out! I think it would definitely work, but I would add a little xanthan gum. Perhaps half the amount recommended at the bottom of the recipe. Let me know how it turns out! Just made these in mini cake molds to give as holiday gifts. It was so moist and delicious! Thank you for the great recipe! this sounds amazing! I’m looking forward to trying this. I was wondering- I love blackstrap molasses- if your tastebuds were used to the blackstrap, do you think that that might be a good choice? Also, since I’d be making a gluten-free version, but dont use the gums, I was wondering if I could mix the hot water in with the other liquids, to reduce the time between mixing and putting the whole pan in the oven (for the baking soda)? New to all of this…thank you so much! Hi Nikki! If you like blackstrap, go for it! It has more health benefits than regular, but most people find it too bitter. Unfortunately, I made the GF version without xanthan gum and it didn’t work — too dense and mushy. I don’t think adding the hot water quickly would solve the problem. I’m not an expert in GF baking, so unfortunately I don’t know how to make this without the xanthan gum. Is that supposed to be baking powder, or soda? Making a shopping list, and I have one, but not the other. No problem! Baking soda, NOT powder. Do you think I could fit this recipe into two paper loaf pans? Instead of an 8 x 8 baking dish? I am thinking about giving them away as gifts…so delicious! I think you could in small loaf pans rather than a large one! LOVED this…as did everyone. 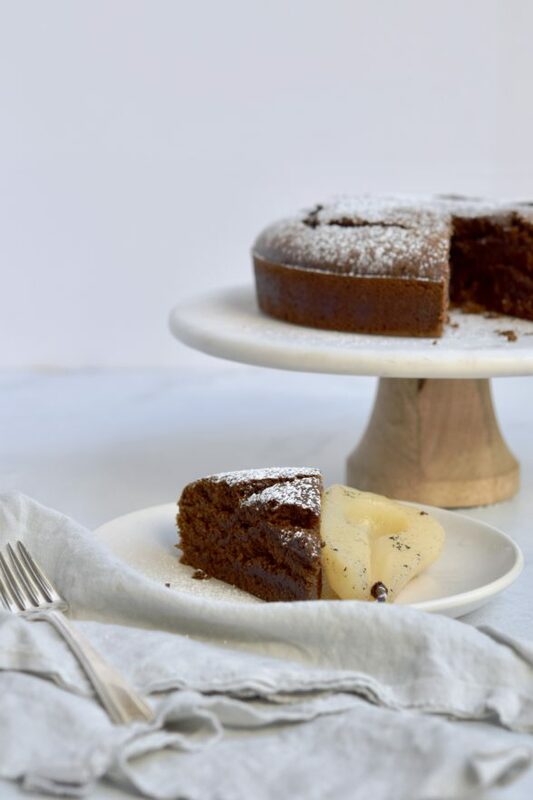 So delicious and not sweet which I like, also has a sort of chocolate cake quality….thank you once again for another brilliant recipe! I’m so happy to hear that, Rafaela! I think you’re right, it does have a chocolate cake-quality 🙂 Enjoy the rest of the weekend! Finally tried the gingerbread, and it was fabulous! The house smelled like “holiday” once again (without the work, enjoyable though it may be, of making Christmas cookies). I made the muffins and treated myself to a comforting snack with a cup of tea. Thanks again! That sounds lovely, Mia. If you don’t think you’ll finish the muffins, they freeze very nicely. I made this for a party Saturday night and it was a hit. The cake is so moist and was so easy to make. I can’t afford to get hooked on these, but it could be easy. I am crazy for this gingerbread, too, and I find myself cutting little slivers during the day. Glad it was a hit at your party!